In February 2010, Wolfgang Schäuble, then German finance minister, proposed the creation of a European Monetary Fund. His suggestion was quickly dismissed by the French government and other European partners. This year, Mr Schäuble, now the speaker of the Bundestag, floated the idea again. It would be a big mistake for Germany’s partners to ignore it a second time. Europe needs a monetary fund to shore up its resilience and capacity to absorb shocks. The eurozone almost collapsed in 2011-12 when money stopped flowing from one country to another. Emerging economies are familiar with such “sudden stops” in cross-border capital flows. They call for a two-pronged remedy: ample — and temporary — external liquidity support, and austerity measures that remedy the underlying imbalances. It is the job, and the art, of a monetary fund to find the right mix between such “financing” and “adjustment”. The European Stability Mechanism, the eurozone bailout fund created in the heat of the crisis, could play that role. However, to transform the ESM into a true European Monetary Fund, three significant changes must be introduced. First, the EMF must have direct access to European Central Bank financing. At the moment, all emergency support inside the eurozone comes from national budgets. The ESM borrows on capital markets with a full and unconditional guarantee by member governments. This makes little sense over the long term. Fiscal resources are scarce. Taxpayers’ money should not be used to fund a liquidity support mechanism. Budget contributions will never provide the kind of firepower necessary to stabilise financial markets and prevent damaging speculation. Experience has shown that, in periods of high volatility and tension, significant amounts of support may be necessary — the so-called “big bazooka”. Almost by definition, a monetary fund must have monetary resources that provide the necessary elasticity. Many people will oppose the idea of drawing on the ECB to finance the European Monetary Fund. “Monetary financing” of governments is a cardinal sin in the eurozone and strictly prohibited by the founding treaties. But this is different. Exactly the same kind of financing occurred when Greece, Ireland, Cyprus and Portugal borrowed from the IMF in 2011-12, with other European countries committing monetary resources to those programmes. Second, defining the conditions, in particular the degree of fiscal austerity to be imposed on those countries receiving support, will not be easy. It was obvious during the crisis that governments do not agree on the proper approach. Some insisted on providing all the liquidity needed to stabilise financial markets. Others wanted to see strong fiscal consolidation as a prerequisite to any help. The solution is simple: together with its own instrument, the eurozone must have its own doctrine. Finally, the EMF governance would have to be adjusted to allow for decisions to be taken by a qualified majority, with “super majorities” for very important matters. At the moment, because support ultimately comes from national budgets, decisions must be taken unanimously and, for some countries, with prior parliamentary approval — a constitutional imperative in Germany. It is a big source of weakness: in crisis times, speed of decision and action is absolutely necessary. Members of the eurozone will have to make choices through vigorous debate. Increasing the area’s financial resilience is as important as improving economic policy co-ordination. A good crisis management tool is an essential complement to a developed capital market union. The eurozone will benefit both over the short and long term, as confidence will be strengthened by its ability to absorb shocks. 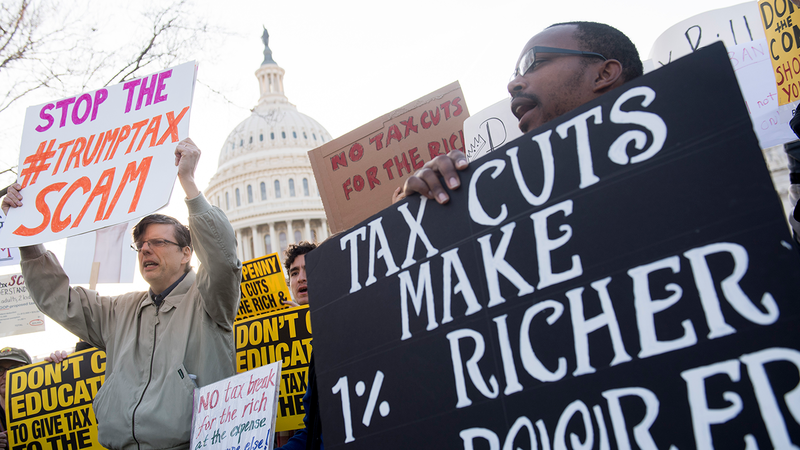 BERKELEY – The tax bill that US Republicans have doggedly pushed through Congress is not as big a deal as many are portraying it to be. It is medium-size news. The big news – the much more weighty and ominous news – lies elsewhere. Of course, medium-size is not nothing. If the tax bill does clear its final hurdle – a conference committee must reconcile the Senate-approved bill with that of the House of Representatives – and become law, it will complicate the tax system considerably, as it opens many loopholes. It won’t have any impact on economic growth – positive or negative – but it would have an impact on the government’s finances, causing revenues to decline by the equivalent of about 1% of national income. The missing resources would most likely be transferred to the top 1% of earners, raising their share of total income from 22% to 23%. The top 0.01% would probably gain the most, with their share of income rising from 5.1% to 5.5%. In this sense, the tax plan would be another brick – not a huge brick, but a medium-size brick – in the increasingly impregnable fortress of American plutocracy. But the bill may well not become law at all. Consider the Republicans’ efforts earlier this year to repeal and replace the Affordable Care Act (“Obamacare”) – an effort that, it now seems clear, was pure Dingbat Kabuki. The Republicans didn’t actually want to take responsibility for changing the health-care financing system, much less strip their own constituents of health care. But the party’s propaganda arm had worked so hard to convince its base that Obamacare represented a clear and present danger to the country that its leaders had to act as if they were making a serious effort to fulfill their promise to repeal and replace it. So a majority of Republicans in the House of Representatives voted for the bill, expecting, with reasonable confidence, that it would be blocked in the 100-member Senate, where fewer than 40 of the 52 Republicans actually wanted it to pass. Had any of the three Republican senators who voted against the bill – John McCain of Arizona, Susan Collins of Maine, or Lisa Murkowski of Alaska – made a different choice, there were probably about five more who would have stepped in to nix it. The same thing may be happening with the tax reform. It depends on whether at least three of the ten Republican senators who have raised objections are serious, or are playing a different game of Dingbat Kabuki: seeking to trick their constituents into thinking that they went the extra mile to try to help them, and are not puppets of Senate Majority Leader Mitch McConnell. But, regardless of whether the tax bill survives the reconciliation process and becomes law, the big news won’t change: the Anglo-Saxon model of representative government is in serious trouble. And there is no solution in sight. For some 400 years, the Anglo-Saxon governance model – exemplified by the republican semi-principality of the Netherlands, the constitutional monarchy of the United Kingdom, and the constitutional republic of the United States of America – was widely regarded as having hit the sweet spot of liberty, security, and prosperity. The greater the divergence from that model, historical experience seemed to confirm, the higher the likelihood of repression, insecurity, and poverty. So countries were frequently and strongly advised to emulate those institutions. Nobody would dare offer that same advice today. The UK, having been thrown into devastating austerity by Conservative and Liberal leaders after the global economic crisis, is now being led by the Conservatives toward a messy and damaging Brexit. And, in the US, the election of President Donald Trump heralded the age of “alternative facts” and “governance by tweet,” overseen by an erratic and ignorant leader who is clearly in over his head. When Trump was first elected, some argued that it did not have to be a disaster. After all, the optimists pointed out, President Ronald Reagan had been more a “chief of state” than a “chief executive,” as had George W. Bush. As divisive as Chief of State Trump would be, according to this view, he wouldn’t derail policy, because electing a Republican president is more like electing the Republican Party establishment. And that bench was very deep and very competent, despite its weakening in recent years. The optimists were wrong. After nearly a year in control of both houses of Congress and the White House, the Republicans haven’t achieved any of their four policy goals: repeal and replacement of Obamacare, infrastructure development, trade-policy reform, or even tax reform. This points to a broken system of politics and governance, one that Americans seem to have no idea how to fix. The US remains the world’s preeminent superpower. But doubts are intensifying over whether it’s still up to the job. In this context, the Republicans’ tax reform, however economically indefensible and blatantly unfair it is, is far from America’s biggest concern. Bitcoin prices are in a bubble. To recognise this, one need only look at the cryptocurrency’s vertiginous path to its current peak of more than $16,000 — and then recall that it has no intrinsic value. It is not productive like oil, and no government stands behind it. It is not even physically attractive, as paintings, gold and tulips are. As of today, the sole legitimate reason to buy bitcoin it is to sell it later for a higher price. Should anyone care about this? There is now quite a bit of nominal value behind bitcoin. Multiply the price by the number of bitcoins and the result is more than $270bn — roughly the market capitalisation and double the book value of Wells Fargo, the third-largest bank in the US. There is reason to think still more money is going to flow to bitcoin. Two major exchanges, the CME Group and Cboe Global Markets Global Markets, are about to launch bitcoin futures exchanges. Historically, asset bubbles ascend to their wildest heights after derivative trading is introduced. Such trading is easier and less capital intensive than cash trading and delivery of the underlying asset. It is telling that Wall Street banks, usually keen to cash in on the sudden popularity of innovative derivatives — mortgage-backed credit default swaps, say — are encouraging regulators to review bitcoin futures more carefully. They have reason to be nervous. Any bitcoin futures trades will have to pass through clearing houses, where defaults are covered by member institutions, such as the brokerage arms of the big banks. If a mass of trades go bad, for example because a crash in the bitcoin price leaves lots of traders unable to make good on their trades, the clearing house could end up holding the bag. It may also be that the banks simply do not want to be involved. As demonstrated by the spiking price, the bitcoin market lacks natural sellers (other than bitcoin “miners” who need to sell bitcoins to pay the electricity bills on their computerised mines). This would leave the brokers either taking the “short” side of trades themselves, a big risk, or refusing to take clients’ trades and potentially losing business. It may be that the futures markets will simply flop for lack of people willing to bet against bitcoin while the price is still rising. If so, good. Speculation in bitcoin (or any other arbitrary thing) should be allowed in a free society — so long as it does not put others at risk. If this collective waste of time and energy fails to take hold, that is likely to be for the best. But will no one else get hurt? Of course, bitcoin could crash to zero. A lot of paper wealth would disappear. But bitcoin is not a bank. It is not highly leveraged, and it seems to have been used as collateral in only a limited number of cases. Much of its nominal value is in essence “found money”. So there is limited cause for worry — until the value gets much higher, or much more leverage seeps into the financial ecosystem surrounding the cryptocurrency. This could happen. Regulators need to follow events closely, and insist on high-margin requirements and tight risk controls for trading in derivatives. While there are no legitimate, non-speculative reasons to buy bitcoin, there are of course significant illegitimate ones. So long as it retains value, bitcoin is a useful tool for tax evaders, money launderers, and anyone who wishes to avoid the rules and regulations that govern traditional fiat currencies. So while it is not necessary to put up regulatory barriers to trading bitcoin, the points where it connects with traditional currencies, banking systems, and tax regimes should be carefully controlled. Innovative technology is not a licence to break the law. The objective of Japan’s surprise attack was to destroy the U.S. Pacific Fleet, and in a matter of two hours, it nearly did just that. None of the eight U.S. battleships stationed at the harbor that day survived unscathed. One was destroyed, one capsized, three sank in shallow waters and three more suffered severe damage. In addition, three of eight cruisers were damaged, as were three of 30 destroyers. Over 180 aircraft were destroyed and roughly 150 sustained damage. (Three aircraft carriers stationed at the base were out on missions and therefore saved from the attack.) Over 2,300 U.S. military members were killed and 1,000 were wounded. The attack severely crippled the U.S. Pacific Fleet and put in question the Navy’s combat capabilities. Japan controlled Pacific waters for three months after the attack. But Pearl Harbor was ultimately only a temporary setback. Strong U.S. rebuilding efforts revived the Pacific Fleet, and in less than six months, it won a decisive victory against the Japanese at the Battle of Midway. Since then, the U.S. Navy has dominated the world’s oceans, largely uncontested. But 76 years after Pearl Harbor, the U.S. Navy is once again under scrutiny, this time because of a series of collisions involving Navy warships, all part of the Pacific Fleet. In May, the USS Lake Champlain guided-missile cruiser collided with a fishing boat in the Sea of Japan. A month later, the USS Fitzgerald destroyer collided with a cargo ship off the coast of Japan. Then in August, another destroyer, the USS John S. McCain, was hit by an oil tanker east of the Strait of Malacca. The latter two collisions resulted in the deaths of 17 American sailors. The Navy concluded that human error was the cause of both of those collisions. These incidents sparked a massive internal investigation, not to mention a media frenzy. Some have interpreted the collisions as a sign that the Navy is headed toward disrepair and is unable to fulfill its growing global responsibilities. Much of the focus has centered on whether too much is being asked of the fleet. But these conclusions are an oversimplification. In this report, we evaluate the state of the U.S. Navy and consider whether the recent incidents merit this level of concern. U.S. dominance of the world’s oceans is a critical component of the country’s position as a global superpower. It is also a key element of the United States’ power projection capability. If U.S. naval power were to decline, it could threaten the United States’ position in the world and change the balance of power in the oceans. To evaluate whether the recent incidents indicate a decline in naval capabilities, we need to begin with a simple question: How does the number of collisions involving U.S. ships this year compare to previous years? First, we should define what we mean by a collision. Naval accidents can involve a number of circumstances, not all of which are classified as collisions. A 1998 report by the Institute for Policy Studies identified 12 types of accidents related to naval vessels that range from fires to weather-related incidents to collisions. The nature and severity of these accidents vary greatly. This report will focus on incidents where one U.S. naval ship comes in contact with another ship or a permanently fixed object. In the past 20 years, ships from the U.S. Navy have been involved in at least 24 collisions, according to open-source information, putting the average at just over one collision per year. Though the number of incidents in 2017 exceeds the annual average, having multiple collisions in a year is not unprecedented. There were three collisions in 2002 and 2005, and two in 2009. From this comparison, we can draw several conclusions. First, the number of collisions this year is not significantly higher than in previous years over the past two decades. Second, the collisions themselves are not an indicator of diminished U.S. naval capabilities, which are defined as the ability to wage war and carry out missions. Both the McCain and the Fitzgerald have been removed from service for repairs, but the U.S. has a total of 62 destroyers. Though there are two fewer in theater, many more are available if needed. It’s also worth noting that collisions have not stopped the Navy from engaging in operations, which have in fact increased over the past 20 years. From 2001 to 2014, the U.S. Navy was engaged in Operation Enduring Freedom as well as three Combined Maritime Forces operations: Combined Task Force 150 (to promote maritime security and counterterrorism), CTF 151 (to counter piracy) and CTF 152 (to support Arabian Gulf security and cooperation). Since 2014, the CTF operations have continued, and Operation Enduring Freedom was replaced by Operation Inherent Resolve. From 2002 to 2017, the U.S. Navy also engaged in Operation Iraqi Freedom, Operation Unified Response and Operation New Dawn. There is thus no evidence that the U.S. Navy’s capabilities are shrinking. In fact, the accidents occurred in areas that are popular trade routes, not in the open seas. The sheer number of vessels operating in these areas increases the chances of an accident occurring. Why, then, have these incidents received so much attention? This can be explained a couple of different ways. The Navy, like all institutions and agencies dependent on federal funds, wants more funding. It can use these collisions to make a compelling case that the government should allocate more resources to it. But more important is that American sailors were killed in these incidents. The 2002 and 2005 collisions did not result in any fatalities. The loss of life is tragic and warrants media coverage, but we should not draw sweeping conclusions about the state of the Navy based on this one factor. It may explain the media, government and military response to this year’s collisions, but it does not make these events geopolitically relevant. If there were a major increase in accidents that forced the Navy to concentrate on critical theaters and thus reduce its global operations, then they would be geopolitically relevant. The comprehensive review of naval readiness triggered by the recent collisions indicates there are some concerns, but they do not rise to a crisis level. Though its ability to conduct war and security operations is still strong, the Navy is not without its challenges. The 2010 Balisle Report, an internal review of the Navy’s surface force from 1999 to 2009, concluded that readiness levels had declined because of a series of systemic changes and problems. A framework introduced in 2001 to manage shipboard personnel resulted in a reduction in personnel requirements. It was called the optimum manning initiative, but it failed to take into consideration the personnel required for maintenance and the loss of personnel due to illness, legal obligations, pregnancy, etc. There were blurred lines of responsibility for material readiness, and the number of related inspections and reviews were cut roughly in half. The time allotted for a ship to go through maintenance was reduced from 15 weeks to nine weeks, and the length of time between board extension visits, which are part of the inspection process, was expanded from 44 months to 60 months. The review following the recent collisions also indicated some shortcomings in terms of the operational readiness of the entire Navy. The report focused primarily on training and concluded that surface warfare officers, quartermasters and operational specialists do not receive enough training. They are overly dependent on on-the-job training, which is not uniform across the Navy. There is a deficiency in navigation skills due to poor training and a lack of consistency in equipment on each ship. A decrease in classroom education has also caused a general decline in the knowledge base of the surface force, particularly when it comes to understanding and applying international rules on navigation. These findings have raised concerns over readiness levels and the long-term consequences of these issues should they persist. The Navy’s main strategic challenges relate to two issues: the number of international commitments and the stationing of forces in overseas homeports. From 1998 to 2015, the number of vessels in the U.S. Navy declined by 20 percent, from 333 ships to 271. Fewer ships does not necessarily mean a decline in capabilities. Not all ships are equal; an aircraft carrier provides capabilities a frigate never could. But over this period, the number of ships deployed overseas has remained the same at about 100, and yet, U.S. military commitments have increased. The 5th Fleet is heavily engaged in the Middle East, and the 6th Fleet and the 7th Fleet are permanently based in Europe and in the Western Pacific, respectively. Deployment times – the number of days a ship spends away from port – have also increased. In 1998, only 4 percent of deployments lasted more than six months, but in 2015, all deployments lasted more than six months. Navy officials today advocate deployment times of six to seven months. This could lead to overextension, which is a problem not only for the Navy but for the U.S. military as a whole. Current U.S. maritime strategy relies heavily on forward naval presence: the ability to station ships and sailors overseas and maintain naval bases in locations like Guam, Japan, Spain and Bahrain. The Navy measures a ship’s ability to provide forward presence based on the amount of time the ship spends in an area of operation, the amount of time it is available for tasking, and the amount of time it is actually underway (i.e., not in its homeport). Navy officials look at all three criteria together and note that there are intangible benefits to having a ship in an overseas port even if it is not operationally available. The purpose of forward deployment is to have ships available in every corner of the planet at any given time, maximizing the Navy’s ability to project power. It can respond to threats quicker by cutting down transit time to hot zones. This also helps protect shipping lanes, deter conflicts, build regional partnerships and prevent enemies from gaining an upper hand in maritime disputes or sea routes. There are two commonly cited criticisms of forward deployment: Underway times are too long, and maintenance times are too short. Over the past two decades, the percentage of ships underway has fluctuated. From 1998 to 2009, it increased from 62 percent of the total fleet to 86 percent. But by 2015, it decreased to 75 percent. From 2003 to 2012, forward deployed ships spent on average 42 more days underway than ships that had a homeport in the United States. The 7th Fleet’s cruisers and destroyers spent an average of 116 days underway in 2015 and 162 days in 2016. But underway times don’t provide the full picture; you also need to look at the types of missions a fleet is involved in to determine whether it is in danger of exhaustion. A month of friendly port calls is different from a month of joint exercises, and both are different from a month of actual combat. A more nuanced view of how this time is spent is necessary. By design, forward deployed ships, particularly cruisers and destroyers, have significantly reduced maintenance and training times compared to ships with homeports in the United States. Of the forward deployed naval forces, the Pacific Command’s 7th Fleet faces the most wear and tear. Forward deployed ships leave their ports more frequently and for shorter deployments. As a result, dedicated training and certification time is often postponed or skipped to deal with more immediate operational concerns. The number of days underway compounds this problem. A surface ship must be certified in 22 different areas: 10 warfare mission areas, like anti-submarine warfare and ballistic missile defense, and 12 basic function areas, like communications and, importantly, mobility and seamanship. The latest Government Accountability Office report on the matter noted that expired training certifications for the Navy’s 11 cruisers and destroyers based in Japan increased from 7 percent in January 2015 to 37 percent in June 2017. Two-thirds of the certifications had been expired for at least five months. None of these ships have all their necessary certifications. Reduced maintenance times do not necessarily reduce the Navy’s ability to effectively wage war, but they do raise concerns over how long these ships can operate before needing to be replaced. The average age of the cruisers based in Japan is 28 years, and the average age of the destroyers is 21 years. The expected lifespan of these ships is 25-30 years, though this can be increased to up to 40 years with modernization and maintenance. But the amount of time needed to modernize and maintain these ships has also increased – just as the time allotted for maintenance has decreased – which affects their overall operational availability. The U.S. Navy has four options to help mitigate these challenges while maintaining its current level of overseas presence. The first option is to simply increase the number of ships it has. The Navy’s 2016 Force Structure Assessment called for a total fleet of 355 ships; the same assessment in 2015 called for 308. (The Navy currently has 271.) Another option is to allot more funding for maintenance and personnel to compensate for an increase in underway times. The third option is to increase the number of forward deployed ships to reduce transit times to critical regions. And finally, the Navy could restructure the fleet to make it more efficient. Right now, the first two options are the most frequently pursued, but they will also incur higher costs over an extended period. A core obstacle in assessing readiness and determining the extent of the readiness challenges facing the military is the lack of a universally accepted definition of “readiness.” The Department of Defense defines it as “the ability of military forces to fight and meet the demands of assigned missions.” But this definition is fairly broad. An evaluation of readiness can focus on near-term or long-term objectives, or measurements at the strategic level down or the operational level. The lack of a consistent definition allows both sides in the debate to cherry pick relevant data to demonstrate the need for either higher or lower levels of funding. This runs the risk of politicizing the debate over readiness, which, at its core, is about assessing U.S. forces’ ability to carry out missions. The debate over the state of the Navy should also be put into context. Despite the shortcomings mentioned in this report, the U.S. Navy has no challenger that comes close to its capabilities. The United States’ main naval rival today is China. The U.S. spent just over $600 billion on defense this year, while China spent a quarter of that amount. The U.S. has a robust fleet that includes 10 aircraft carriers, 68 submarines, 23 cruisers, 62 destroyers and 31 principal amphibious vessels stationed across the world. China’s navy consists of only one aircraft carrier, 57 submarines, 21 destroyers and four principal amphibious vessels. China has naval ports outside of the country, but these facilities provide primarily logistical support; they do not function as forward deployment facilities. In addition, U.S. sailors not only outnumber Chinese sailors (the U.S. has 327,750 and China has 235,000) but they also – despite the criticism over the past year – have much more combat and operational experience due to the U.S. Navy’s global reach. China has very limited experience in sailing a carrier battle group, and its pilots might be trained but they lack experience. China has plans to build more ships, but this takes time. The power of the U.S. Navy, therefore, still outstrips that of the Chinese navy. After the attack at Pearl Harbor, the U.S. Pacific Fleet was badly damaged and unable to wage war. Today’s Pacific Fleet has its challenges, but it can still wage war if called upon, and its capabilities far exceed those of any other navy. U.S. naval power is not in decline.